and theres sure to be a change in way"
"Round and Round" or "Uncle Salty"
"Walk This Way" is a song by the American hard rock band Aerosmith. Written by Steven Tyler and Joe Perry, the song was originally released as the second single from the 1975 album Toys in the Attic. It peaked at number 10 on the Billboard Hot 100 in early 1977, part of a string of successful hit singles for the band in the 1970s. In addition to being one of the songs that helped break Aerosmith into the mainstream in the 1970s, it also helped revitalize their career in the 1980s when it was covered by rappers Run–D.M.C. on their 1986 album Raising Hell. This cover was a touchstone for the new musical subgenre of rap rock, or the melding of rock and hip hop. It became an international hit and won both groups a Soul Train Music Award for Best Rap – Single in 1987. The song starts out with a two measure drum beat intro by Joey Kramer, followed by the well known guitar riff by Joe Perry. The song proceeds with the main riff made famous by Perry and Brad Whitford on guitar with Tom Hamilton on bass. The song continues with rapid fire lyrics by Steven Tyler. played another riff and went there. But I didn't want the song to have a typical, boring 1, 4, 5 chord progression. After playing the first riff in the key of C, I shifted to E before returning to C for the verse and chorus. By the end of the sound check, I had the basics of a song. When bandmate Steven Tyler heard Perry playing that riff he "ran out and sat behind the drums and jammed." Tyler scatted "nonsensical words initially to feel where the lyrics should go before adding them later." When the group was halfway through recording Toys in the Attic in early 1975 at Record Plant in New York City, they found themselves stuck for material. They had written three or four songs for the album, having "to write the rest in the studio." They decided to give the song Perry had come up with in Hawaii a try, but it did not have lyrics or a title yet. Deciding to take a break from recording, band members and producer Jack [Douglas] went down to Times Square to see Mel Brooks' Young Frankenstein. Returning to the studio, they were laughing about Marty Feldman telling Gene Wilder to follow him in the film, saying "walk this way" and limping. Douglas suggested this as a title for their song. But they still needed lyrics. At the hotel that night Tyler wrote lyrics for the song, but left them in the cab on the way to the studio next morning. He says: "I must have been stoned. All the blood drained out of my face, but no one believed me. They thought I never got around to writing them." Upset, he took a cassette tape with the instrumental track we had recorded and a portable tape player with headphones and "disappeared into the stairwell." He "grabbed a few No. 2 pencils" but forgot to take paper. He wrote the lyrics on the wall at "the Record Plant's top floor and then down a few stairs of the back stairway." After "two or three hours" he "ran downstairs for a legal pad and ran back up and copied them down." The words have to tell a story, but for Steven they also have to have a bouncy feel for flow. Then he searches for words that have a double entendre, which comes out of the blues tradition. Perry always liked to wait until Tyler recorded his vocal so he "could weave around his vocal attack," but Tyler wanted Perry to record first for the same reason. After a "tug-of-war", Tyler's vocal was recorded first with Perry's guitar track overdubbed. The lyrics, which tell the story of a high school boy losing his virginity, are sung quite fast by Tyler, with heavy emphasis being placed on the rhyming lyrics (e.g., "so I took a big chance at the high school dance"). Between the elaborately detailed verses, the chorus primarily consists of a repetition of "Walk this way, talk this way". Live in concert, Tyler often has the audience, combined with members of the band, sing "talk this way". There is also a lengthy guitar solo at the end of the song, and in concert, Tyler will often harmonize his voice to mimic the sounds of the guitar. "Walk This Way" was one of two hit singles by the band to hit the Top 10 of the Billboard Hot 100 in the 1970s, the other one being a re-release of "Dream On". 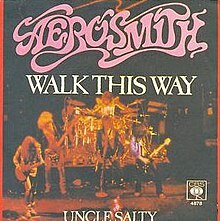 "Walk This Way", though, helped Toys in the Attic to be the bestselling Aerosmith album, and one of the most critically acclaimed. Aerosmith's version of "Walk This Way" often competes with "Sweet Emotion" and "Dream On" for the title of Aerosmith's signature song, being one of the band's most important, influential, and recognizable songs. The band rarely omits it from their concert setlist, still performing their classic version of the song to this day. The song has also long been a staple of rock radio, garnering regular airplay on mainstream rock, classic rock, and album-oriented rock radio stations. In 2009, it was named the eighth greatest hard rock song of all time by VH1. Fee Waybill, Steve Lukather, Tim Bogert and Tommy Aldridge covered the song for the Aerosmith tribute album Not the Same Old Song and Dance (Eagle Records, 1999). Aerosmith reference lyrics from the song in "Legendary Child". The line "I took a chance at the high school dance never knowing wrong from right" references lyrics from the songs "Walk This Way" and "Adam's Apple" respectively. Both songs first appeared on the album "Toys in the Attic". In 1986, the hip hop group Run–D.M.C. performed a cover of "Walk This Way" with Steven Tyler and Joe Perry guesting on vocals and guitars. While working on Raising Hell, Rick Rubin pulled out Toys in the Attic (an album they freestyled over) and explained who Aerosmith were. While Joseph Simmons and Darryl McDaniels had no idea who Aerosmith were at that time, Rubin suggested remaking the song. Neither Simmons nor McDaniels liked the idea, though Jam Master Jay was open to it. Later, however, Run–D.M.C. covered the song. D.M.C. called it "a beautiful thing" in a trailer for Guitar Hero. In the Run–D.M.C. cover, a turntable and drum machine are added in to reflect the additional hip hop influence on the record. Both the original Aerosmith version and the Run–D.M.C. cover (featuring Tyler and Perry) appear on various Aerosmith compilations as well as Run-D.M.C. albums. In 1989, Tyler and Perry joined Bon Jovi at a concert at Milton Keynes Bowl in the United Kingdom for an encore performance and extended jam of the song. On September 9, 1999, Kid Rock joined Run–D.M.C. and Aerosmith for an updated rendition of "Walk This Way" at the 1999 MTV Video Music Awards. In 2002, Kid Rock and Run–D.M.C. (as separate acts) opened for Aerosmith on the first leg of the Girls of Summer Tour. Each night, at the end of Aerosmith's set, Kid Rock and Run–D.M.C. would join Aerosmith for an encore collaborative performance of "Walk This Way". At the Super Bowl XXXV halftime show in January 2001, performers *NSYNC, Britney Spears, Mary J. Blige, and Nelly joined Aerosmith onstage for an encore performance of "Walk This Way" with Spears and members of *NSYNC singing different parts of the second verse, Blige adding background harmony, and Nelly performing a rap towards the end of the song. At the Hyde Park Calling festival in London on June 24, 2007 (a date on Aerosmith's 2007 world tour), D.M.C. joined Aerosmith on stage for their encore performance of "Walk This Way". Also, Fergie joined Aerosmith once on television to duet with Tyler to sing "Walk This Way". Both the Run–D.M.C. version and the original version of the song are featured in Guitar Hero: Aerosmith. The Run-DMC version appeared in dance video games Dance Dance Revolution Ultramix 3 and Just Dance 2015. Tyler has also performed the song with Carrie Underwood on two occasions. On their 2015 Wheels Up Tour, country pop trio Lady Antebellum and their special guests Hunter Hayes and Sam Hunt performed the song. The song won both groups a Soul Train Music Award for Best Rap - Single in 1987. The song "Walk This Way" is part of the The Rock and Roll Hall of Fame's 500 Songs that Shaped Rock and Roll list. Rolling Stone ranked the original version of "Walk This Way" at number 346 on their list of the 500 Greatest Songs of All Time. The version by Run–D.M.C. is ranked at number 293. In 2000, "VH1: 100 Greatest Rock Songs" included "Walk This Way" at number 35. In March 2005, Q magazine placed it at number 23 in its list of the 100 Greatest Guitar Tracks. In 2009, VH1's "100 Greatest Hard Rock Songs" included "Walk This Way" at number 8. VH1 ranked the version by Run–D.M.C. at number 4 on VH1 100 Greatest Hip Hop Songs. In 1993, "Rolling Stone: The Top 100 Music Videos" included "Walk This Way" (with Run–D.M.C.) at number 11. In 1999, "MTV: 100 Greatest Videos Ever Made" included "Walk This Way" (with Run–D.M.C.) at number 5. In 2001, "VH1: 100 Greatest Videos" included "Walk This Way" (with Run–D.M.C.) at number 11. In 2007, "Fuse: 25 Greatest Music Videos" included "Walk This Way (with Run–D.M.C.) at number 24. In 1997, The String Cheese Incident covered the song on their live album A String Cheese Incident. Although faithful to the intro and main riff, this version is heavily bluegrass-influenced. After the release it was released in a compilation album. This cover is a crossover between bluegrass and rock. In 2007, British girl groups Girls Aloud and Sugababes recorded a cover of "Walk This Way" as the official Comic Relief charity single. Their version was produced by American producer Dallas Austin, making it Girls Aloud's first single not to be produced by Xenomania. The track charted at number one on the UK Singles Chart, giving Girls Aloud their third number 1 and Sugababes their fifth. The music video was a comic re-enactment of the Run–D.M.C. video. "Walk This Way" was promoted through numerous live appearances and has been included on tours by both Girls Aloud and Sugababes. Contemporary music critics criticised the cover version, but supported the single due to its fundraising nature. While the Run–D.M.C. cover is nearly identical to the original version, the Girls Aloud/Sugababes version has a few changes tweaked into the song; the additional line "Walk this way, you wanna talk this way" is added, the vocoder is added, the rap breakdown, the lyrics are moved around, and the beat is slightly sped up and realized on a drum machine to add a further dance-pop feel to the song. The idea of a Girls Aloud and Sugababes collaboration came from Comic Relief co-founder and trustee Richard Curtis. Several songs were possibilities, including Blur's "Girls & Boys" and Candi Staton's "You Got the Love", which was Girls Aloud member Nicola Roberts' idea and favourite choice. "Walk This Way" is notably the first Girls Aloud single to date not to feature production from Brian Higgins and Xenomania, who have also worked with Sugababes. Girls Aloud and Sugababes launched the charity appeal on January 31. Kimberley Walsh of Girls Aloud said, "It's a fantastic song and hopefully will raise tons of money for people living in really difficult situations here and in Africa." It was also available as a digital download. "Walk This Way" entered the UK Singles Chart at number 1 on March 18, 2007 ― for the week ending date March 24, 2007. The following week, the single dropped to number 2; it was dethroned by another Comic Relief single, "I'm Gonna Roll (500 Miles)" by The Proclaimers with Peter Kay and Matt Lucas. In its third week on the chart, "Walk This Way" dropped twelve places out of the top ten, placing itself at number 14. The song also charted at number 8 on the Billboard European Hot 100 Singles chart. The music video premiered on The Box on February 2, 2007, and was shown on Channel 4's Popworld the following day. The video was filmed over three days in January 2007 – Sugababes on the first, Cheryl Cole, Nicola Roberts, and Kimberley Walsh on the second, and Nadine Coyle and Sarah Harding on the third and final day. The premise of the video was a comic re-enactment of the Run-D.M.C. video, with Girls Aloud as the rockers and Sugababes as Run–D.M.C. At the end of the video Davina McCall, Lily Cole, Ewen MacIntosh, Jocelyn Jee Esien, Ruby Wax, Graham Norton, Stephen Mangan, Oliver Chris, and Natalie Cassidy also appear, with red noses being thrown at the two groups at the end. "Walk This Way" was performed by Girls Aloud and Sugababes for the first time on Comic Relief Does Fame Academy on March 10, 2007. They performed the song on Comic Relief's Red Nose Day 2007 telethon on March 16. Girls Aloud performed "Walk This Way" without Sugababes on 2007's The Sound of Girls Aloud: The Greatest Hits Tour. The following year, they performed the song in a medley with "Wake Me Up" on the Tangled Up Tour. Sugababes performed "Walk This Way" without Girls Aloud on 2007's Overloaded: The Singles Tour. These are the formats and track listings of major single releases of "Walk This Way". ^ Yasui, Todd Allan (September 17, 1987). "Faster Pussycat Scratches". The Washington Post. ^ a b c d Myers, Marc (11 September 2014). "How Aerosmith Created 'Walk This Way': A look at how the hard-rock band, inspired in part by 'Young Frankenstein,' came up with a song that would become a top-10 hit twice". The Wall Street Journal. Retrieved 15 September 2014. ^ "Walk their way | Aerosmith News". AeroForceOne. Retrieved January 20, 2011. ^ "Walk this way in Canadian Top Singles Chart". Library and Archives Canada. Retrieved 17 June 2013. ^ "Aerosmith awards on Allmusic". Allmusic. Retrieved 17 June 2013. ^ "Billboard Top 100 - 1977". Retrieved February 9, 2010. ^ Stephen Thomas Erlewine. "Run-D.M.C. biography on Allmusic". Allmusic. Rovi Corporation. Retrieved 10 July 2013. "Run-D.M.C. 's fusion of rock and rap broke into the mainstream with their third album, 1986's Raising Hell. The album was preceded by the Top Ten R&B single "My Adidas," which set the stage for the group's biggest hit single, a cover of Aerosmith's "Walk This Way."" ^ Cheryl Lynette Keyes (2004). University of Illinois Press, ed. Rap Music And Street Consciousness. p. 80. ISBN 978-0252072017. "Raising Hell (...) success was attributed to the extensive fusion of hard rock with rap, as best illustrated with [Run–D.M.C. ]'s remake of Aerosmith's "Walk This Way."" ^ "Acclaimed Music Top 3000 songs". May 27, 2009. ^ Rodman, Sarah (Aug 30, 2002). "Walk their way; Boston's Aerosmith opens up for VH1's `Behind the Music'". Boston Herald. pp. Scene section page 3. Retrieved May 23, 2011. ^ This was published in Brazilian rock magazine Roadie Crew, issue 100 (May 2007), in its entry for Aerosmith's Toys in the Attic (in which "Walk This Way" was first released), mentioning the video for the Run–D.M.C./Aerosmith joint version. ^ Danyel Smith, ed. (1986). Billboard 22 nov. 1986. Nielsen Business Media, Inc. ISSN 0006-2510. Retrieved 17 June 2013. ^ "Austriancharts.at – Run DMC – Walk This Way" (in German). Ö3 Austria Top 40. ^ "Ultratop.be – Run DMC – Walk This Way" (in Dutch). Ultratop 50. ^ "Walk this way in French Chart" (in French). Dominic DURAND / InfoDisc. 17 June 2013. Retrieved 17 June 2013. You have to use the index at the top of the page and search "Run-D.M.C." ^ "Offiziellecharts.de – Run DMC – Walk This Way". GfK Entertainment Charts. ^ "Walk this way in Irish Chart". IRMA. Retrieved 17 June 2013. 2nd result when searching "Walk this way"
^ "The best-selling singles of 1986 in Italy". HitParadeItalia (it). Retrieved 17 June 2013. ^ "Nederlandse Top 40 – Run DMC search results" (in Dutch) Dutch Top 40. ^ "Dutchcharts.nl – Run DMC – Walk This Way" (in Dutch). Single Top 100. ^ "Charts.org.nz – Run DMC – Walk This Way". Top 40 Singles. ^ "Norwegiancharts.com – Run DMC – Walk This Way". VG-lista. ^ "Swisscharts.com – Run DMC – Walk This Way". Swiss Singles Chart. ^ "1986 Top 40 Official UK Singles Archive - 27th September 1986". Official Charts Company. Retrieved 17 June 2013. ^ a b c d "Run-D.M.C. awards on Allmusic". Allmusic. Retrieved 17 June 2013. ^ "Billboard Top 100 - 1986". Retrieved February 9, 2010. ^ "'Walk This Way' Makes 100 Greatest Guitar Songs of All Time". Gavin Edwards. Rolling Stone. Retrieved June 12, 2008. ^ a b c d Robinson, Peter (2009). "Walk This Way". The Singles Boxset (Booklet). Girls Aloud. London, England: Fascination Records. p. 35. ^ "Girl groups get red noses rolling". BBC News. BBC. January 31, 2007. Retrieved August 31, 2010. ^ "Sugababes Vs Girls Aloud - Walk This Way (CD, Single, Enh)". Discogs. Zink Media. Retrieved August 31, 2010. ^ "Comic Relief tune takes top spot". CBBC Newsround. BBC. March 18, 2007. Retrieved August 31, 2010. ^ "Comic Relief song strolls to top of charts". Reuters. Thomson Reuters. March 18, 2007. Retrieved August 31, 2010. ^ "Comic Relief tune in top spot". CBBC Newsround. BBC. March 25, 2007. Retrieved August 31, 2010. ^ "Proclaimers hang on to top spot". BBC News. BBC. April 1, 2007. Retrieved August 31, 2010. ^ a b European Hot 100 "European Hot 100 - Week of March 31, 2007" Check |url= value (help). Billboard. Nielsen Company. Retrieved August 31, 2010. ^ "Chart Track: Week 11, 2007". Irish Singles Chart. ^ "24, 2007/ Archive Chart: March 24, 2007" UK Singles Chart.